I've changed the colours because some people complained about the white on black - I'm not sure myself, it may change back yet ;) The content will change somewhat over the next few weeks as I add more to the Lathe and Mill pages! If anyone has any small CNC jobs they would like doing I'd be more than happy to give a quote, just email me and I'll see what can be done! I've done a CNC conversion on a Sieg SX3 and this is my current mill. No photos of it completed, but there are a few here taken during the conversion prorocess. I'll try and add some soon. 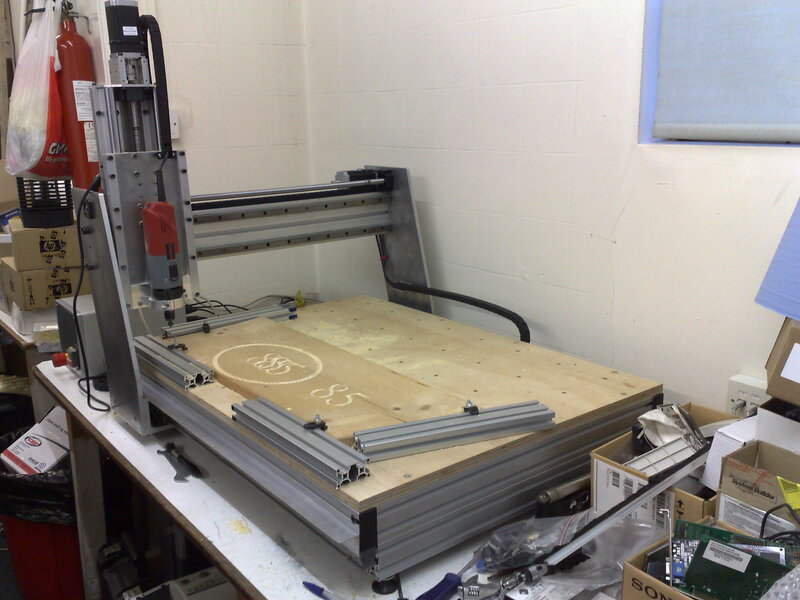 I've also built a CNC router, which happily runs at 5000mm/min. This is an early picture of the router during testing. I'm also converting a Sieg C6 lathe to CNC, photos to follow on that as work progresses. This list is for the discussion of CAD, CAM, EDM, DRO and any other related activities including non CNC machining problems. The list is aimed at the construction, repair and use of this equipment primarily in a home/small workshop environment, but commercial users are very welcome. Although membership of the group is moderated, nothing vaguely engineering related is "off topic".